The larvae feed on a wide range of plant species both native and introduced. They are attended by green tree ants Oecophylla smaragdina. Mature larvae green with a narrow reddish-brown line and yellowish bands. 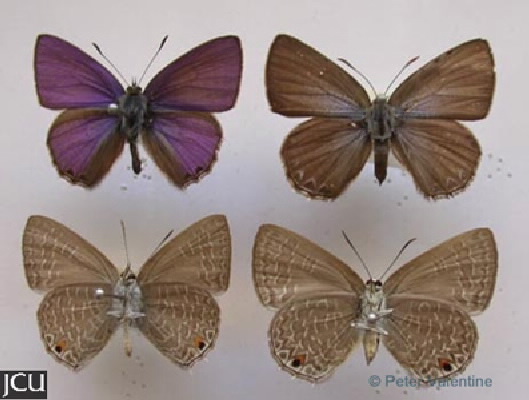 Adult male is shining violet-purple with a narrow black edge and the hind wing has two black spots; female is dark brown with a bluish-base, hind wing has dull bands, both sexes have 4 small projections on the hind wing; lower surface grey-brown with pale brown spots and bands edged with white, black spot near the lower edge of hind is edged in orange-red.